It finally happened. After one full year of neither twin getting sick, we caught a bug. Tis’ the season! Fortunately, it’s just a little cold, but unfortunately, there’s nothing that can be done other than to wait it out. It all started with a runny nose. Corbin and I both started sniffling, and then the cough came along due to drainage in the throat. Nothing is worse than seeing your baby uncomfortable. 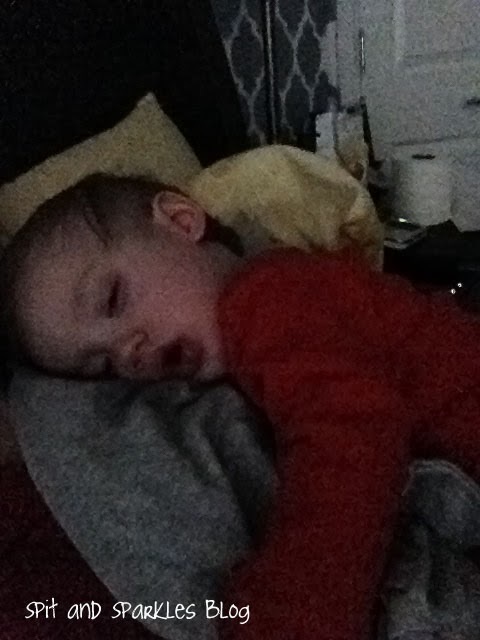 He did not have fever, acted himself and was sleeping well, so I chose not to go to the doctor right away. I did, however, consult Dr. Google, and determined that this was just a cold that has to pass on its own. Derrick and I did a few things we already knew about to help make Corbin more comfortable, and I asked parents, friends and looked online for other tips. 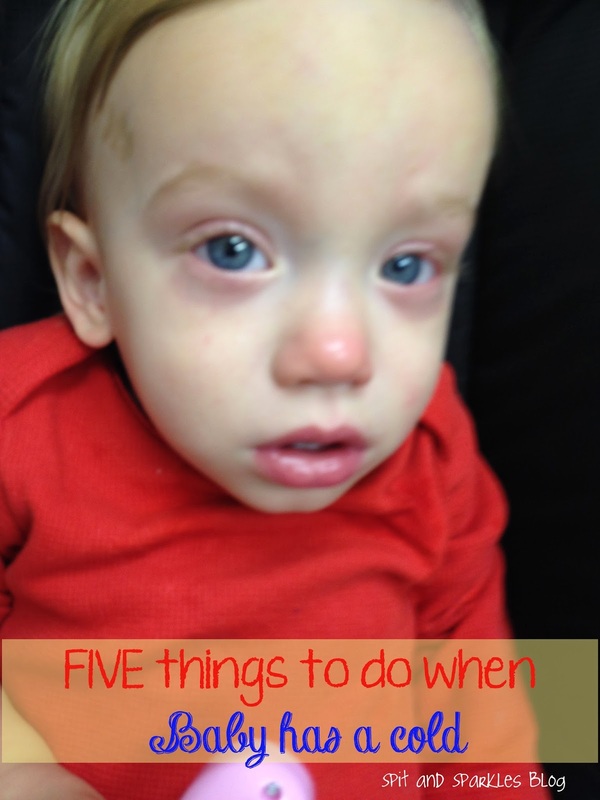 We tried all of these things for a few days, but I did end up taking him in on day four because it sounded like his cough was getting worse. He’s fine. No ear or lung infection, so we keep waiting it out. (Note: Seek medical attention if your baby’s cough sounds dry, weezy or like a bark, and is accompanied by a fever. This could indicate infection.) We added a couple more tips to our list thanks to the doctor. 1. Use a vaporizer or a cool mist humidifier during naps and during nighttime sleep. 2. You can also create a sauna in your bathroom. Take baby into the bathroom, close the door and turn the water on as hot as it will go. Breathing in the steam will help open up the airways. Don’t forget to bring some toys in there with you to keep baby occupied. Then give him/her a warm bubble bath because baths always make us feel better, right! He looks a little happier here, don’t you think? Corbin and I went to the sauna twice on one of the days. 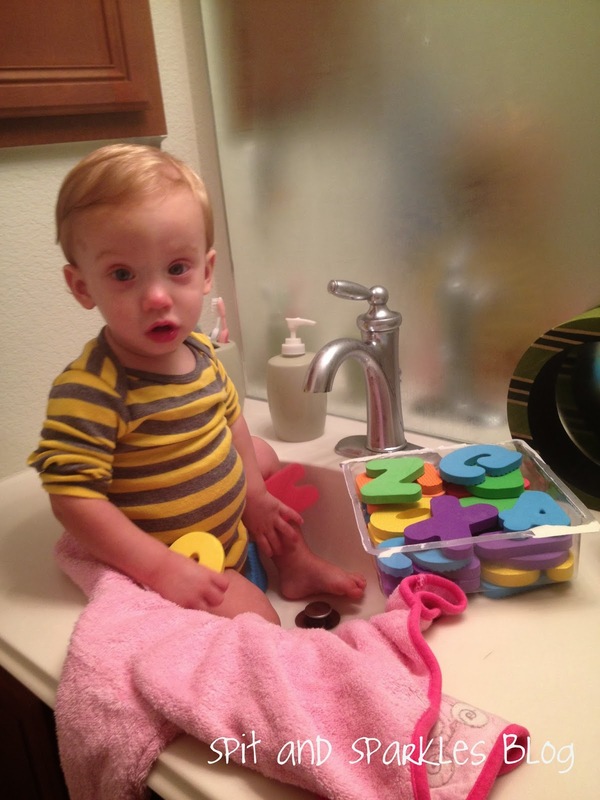 We played with some of the bath toys and spelled out words with the foam letters. At first, I let him sit on the floor, until silly me remembered that steam rises! I was breathing it all in, while he happily played just below the steam. Haha! He was just as happy to sit in the sink and play and watch me write things on the mirror. We stayed in there as long as we could stand it! It definitely helped me breathe and helped with my runny nose, so I know that it helped Corbin too. 3. Apply baby vapor rub to the chest, neck, back, and apply to the bottom of the feet and cover with socks. Feet? You may ask. Yes! Apparently, it’s an old trick that I’d never heard of until now. It works! Corbin woke up so happy in the morning with a dry nose! 4. Elevate your baby/child’s bed. This will help the drainage flow down the throat easier, instead of making baby cough during the night and disturbing sleep. We put a couple of hardback books under one end of the bed. We’re not really sure how well this helped because our babies tend to sleep all over the place, so I doubt that Corbin stayed on the high side. 5. To relieve a raw nose from wiping and blowing, dab a little Chapstick brand lip balm around and underneath the nostrils. This is a tip from my stepdad that works like magic! Wash your hands first. Then use two fingers to apply a little bit of Chapstick to each nostril. Do not use the stick itself or use the same finger to add more Chapstick to your nose. That will infect the tube, and it’s just gross! If you forget to use a different finger, just cut a little off the top of the stick to keep it germ-free for your lips! Finally, give lots of hugs, snuggles and kisses! No-brainer here, but don’t be surprised if your little one is super clingy. Enjoy it! It’s the only plus side to a toddler getting sick. A horrible, blurry iPhone photo, but I couldn’t resist taking a photo of my snuggle bunny! A few other things that we’re doing are using some homeopathic cold and cough remedies. I bought Hyland’s baby cold tablets and Hyland’s baby cough syrup. Not sure if it’s working or not on Corbin, but I’ve been treating Lynley too. So far, she has not developed the runny nose or cough as seriously as Corbin. She definitely caught a milder version of the virus, and maybe all of the things we’ve been doing for Corbin have helped her to stay semi-healthy. We’ve also offered Pedialite to drink if they’ve refused their milk. As you know, when you’re sick your appetite changes, but it’s important to keep hydrated. And that’s it. If you liked this post, please share it, bookmark it for when the time comes, or Pin it! And if you’re reading this because your child is sick. Feel better soon! These tips also work great for adults! 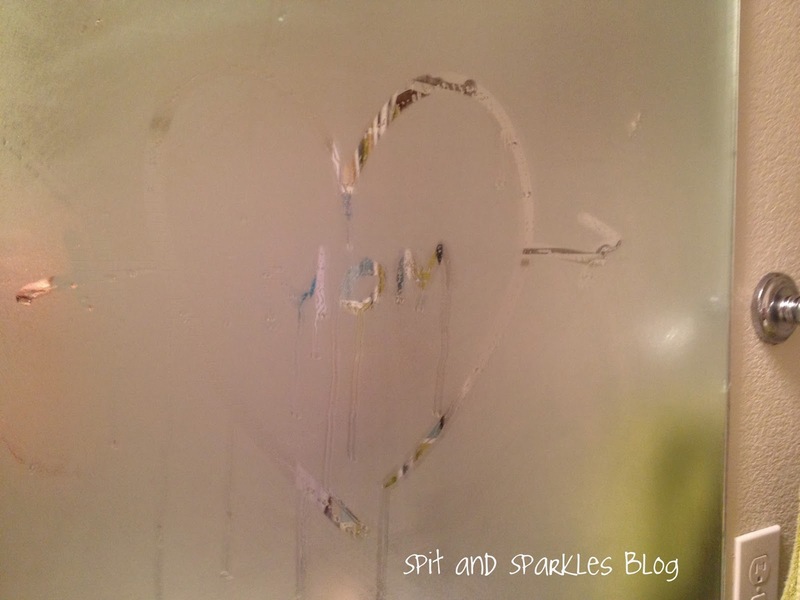 Have you heard of any other tips that help a cold? 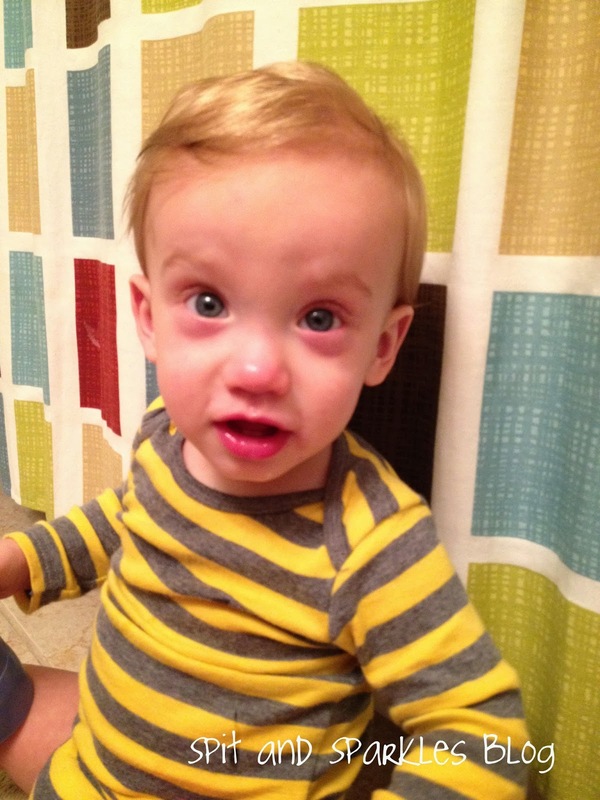 Poor baby … colds are never any fun. Reagan had one recently because she just started daycare. Ugh .. always bringing something home. Thankfully she was over it pretty quickly. Great tips! It’s definitely no fun to get sick with them either! Ugh…. Glad Reagan’s cold didn’t last long. We’re on day 6 over here, and I’m starting to think this crud will never go away!